This is a list of pre-release and unused content for the game Mario & Luigi: Paper Jam. Paper Luigi was also once planned to be playable but was scrapped due to the team believing having four buttons to press would make the game too difficult. Peepas were originally going to appear in the game, but they were scrapped for unknown reasons. However, their unfinished graphics still remain grouped with the Boo graphics. There are some unused overworld graphics of Urchins and Chain Chomps, but they only appear in battles. However, some of the Urchins' overworld graphics are used in the know-it-all Toad's quiz in Sunbeam Plains. There is an unused 3D Green Shell Bros. Attack for Luigi, but this Bros. Attack was removed for unknown reasons. However, the 3D Green Shell graphics still remain grouped with the 3D Red Shell graphics. There is an unused early version of a Paper Red Toad graphics alongside his early version of the Red Balloon graphics for the Toad Trail Bros. Attack. 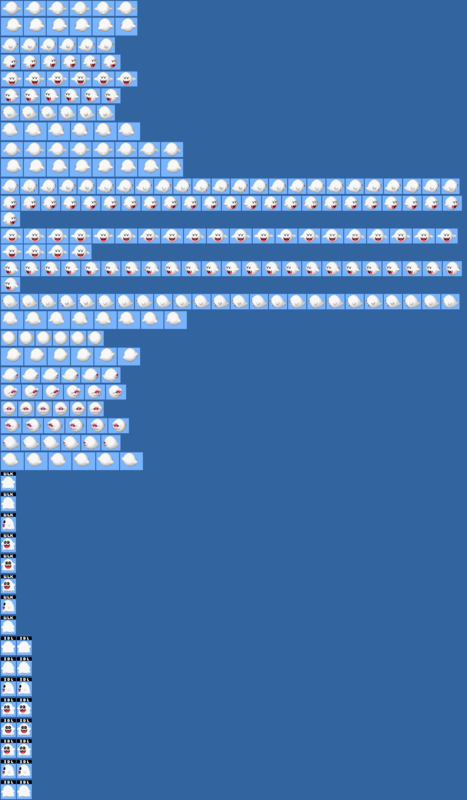 The unused graphics of a Paper Red Toad and his Red Balloons still remain grouped with the Toad Trail graphics. The brothers fighting Petey Piranha in the E3 2015 build. Note how Battle Cards are present. In the Nintendo Direct, the Kamek boss fight took place in Sunbeam Plains instead of Neo Bowser Castle. Screenshots also showed Koopa Troopas and Paper Koopa Troopas being fought in Sunbeam Plains. In the final version, they aren't encountered until Twinsy Tropics. In both the 52nd and 53rd episodes of The Cat Mario Show, Hammer Bros, Paper Hammer Bros, Fire Bros and Paper Fire Bros can be seen being fought in Twinsy Tropics instead of Twinsy Tropics Dungeon. At E3, Battle Cards could seemingly be used as early as the Petey Piranha boss fight, where in the final game they are first used against Wendy and Roy. Also, the number over the cards (which shows the number of Star Points needed to use it) is written in a different color than in the final game (orange as opposed to yellow) and is about twice as small. 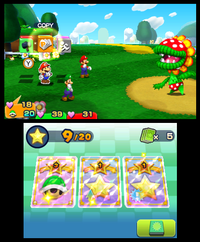 Also in the demo, Paper Mario is able to create copies and perform another action in a single turn: this is normally only possible with a Star Rank-Up Bonus. In addition to the Petey Piranha boss fight, the playable missions were Desert Rescue Party, Fly Guy Patrol, and Paper Toad Rescue. A pre-release version of Desert Rescue Party (left) compared to the final version (right). ↑ Akira Otani (February 5, 2016). Otani's response during the Miiting on Paper Jam. Miiverse. Retrieved July 18, 2017. ↑ Nintendo3DSChannel. (January 3, 2016). Mario & Luigi Paper Jam; All Toad Quizzes. YouTube. Retrived May 20, 2017. This page was last edited on February 5, 2019, at 01:12.